Join fellow wine lovers Thurs. 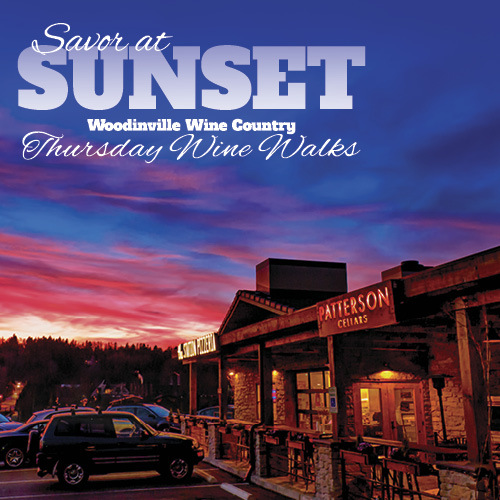 May 5th for the kick-off the summer Wine Walk series called “Savor at Sunset!” This year Seattle Uncorked is partnering with Woodinville Wine Country to bring you a monthly wine walk on the first Thursdays thru October, with a different theme each month! Instead of paying tasting fees at each winery, get your $20 ticket and visit up to 12 wineries. We begin in May with a featured “Cheese & Wine Pairing” at each participating winery in The Junction & Warehouse Districts. Ticket price includes 12 tasting tickets (additional tasting tickets available at on-site check-in) Events are 4–8pm on the 1st Thursday Each Month. Please bring a glass or purchase a GoVino glass for $5!